The young female entrepreneur enhances the qualities of Provencal fruits and vegetables in creams and lotions for well-being. 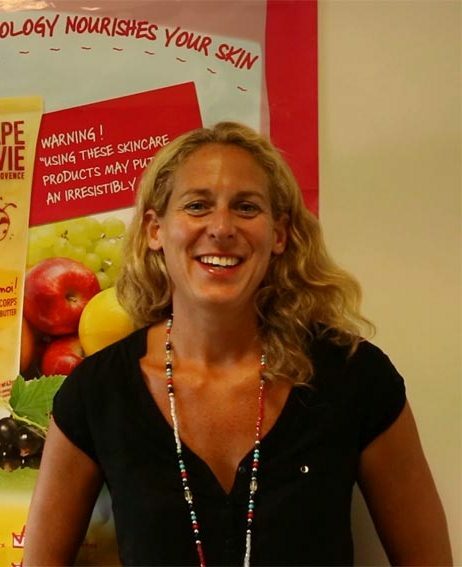 As she was getting bored with austere and guilt-laden organic products, Julie Ducret created a counterintuitive range of skin care products: fresh fruit, colourful packaging, a messenger honeybee… "I had selected two options, this one or the creation of a dating website for the sporting community", she recalls. The choice became clear following the 2008 crisis: "In those days there was a demand for 'feel good' products exemplifying local values and the organic market was increasing by a yearly 30%". The euphoria has ebbed away, but the positioning of Pulpe de Vie (Pulp of Life) in the beauty and healthcare networks – "The 100% French, 100% organic cosmetics company" – now ensures business growth. "I was prepared to face all sorts of trials" Julie humbly discloses. After preparing HEC she graduated from ESC Rouen at the age of 23; she was first hired by the detergent manufacturer Henkel where she became familiar with quantified marketing in the cosmetics division. Four years later she headed for Pepsi, their US-style management and fieldwork sales. "This background has consolidated all my theoretical knowledge, to the extent that I never felt the faintest fear when I created my company". Her "locavore spirit" concept is now running smoothly. "All my fruits and vegetables are bought fresh. They are not flown in and are enhanced, transformed on the spot, so as to preserve most of their antioxidant properties, minerals and vitamins, she states. Our products are made up of at least 25% fruits and 35% biological ingredients, whereas the Ecocert label requires 10% only". The colorants are natural ochres from the Luberon massif, and the remainder, that is ingredients needed in the blending process (floral waters, almond, sunflower and camelina oils, packaging…) is provided from local sources. Her company is supplied by some twenty regional fruit producers and some fifteen industrial subcontractors thanks to whom 4,000 units per year can be produced: "euphoric body exfoliations", "gourmet moisturizers" and themed boxes including a best-seller "sweet chill", a teenager blackhead scrubbing care made from cucumber and apricot stone. Her atypical blends and fragrances have hit the mark: a large presence in France with nearly 300 outlets, from 'Parashop' and 'Mademoiselle Bio' to 'Beauty Monop', she reached a 320,000-Euro turnover last year despite her being delisted from 'Nature & Découverte' which now develops its own product lines. "Pulpe de Vie has been profitable ever since the first year" says a smiling Julie. The upcoming year is expected to reach 500,000 Euros and then 1 million Euros by 2015, in particular thanks to export. Products from Provence appeal to Asians where her products are already on sale in a hundred outlets, representing 15% of her turnover by year end. Pulpe de vie: a start-up supported by Marseille Innovation !